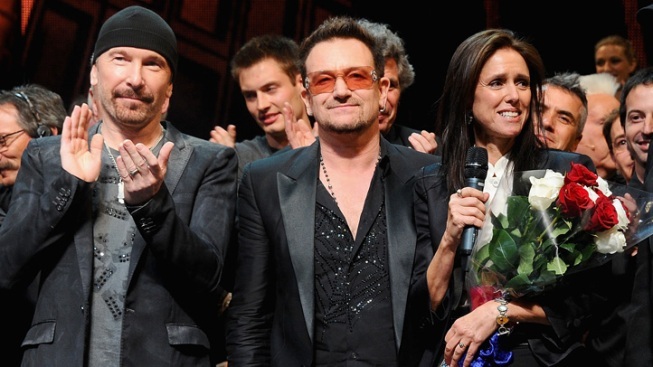 Ousted former "Spider-Man: Turn Off the Dark" director Julie Taymor unexpectedly joined former collaborators Bono and the Edge of U2 onstage at the musical's Broadway opening June 14. Julie Taymor, the ousted director and creative force behind "Spider-Man: Turn Off the Dark," mused Saturday on the production troubles the Broadway musical has faced. She told an audience of industry insiders about her artistic vision for the show, whose music U2's Bono and the Edge wrote, and about what she thinks played a role in its problems. Not least among those, she said: The decision to open the show on Broadway instead of in another city, the constant scrutiny the celebrity-studded production faced and the power of social media. "It's incredibly difficult to be under a shot-glass and a microscope like that," she said of the heavy publicity and interminable lead-up to the show's opening earlier this week. "Twitter, Facebook, blogging just trumps you." Taymor criticized the use of focus groups to help make major artistic decisions on the show, too. “It’s very scary if people are going more towards that, to have audiences tell you how to make a show,” she said. “Shakespeare would have been appalled." The show had clocked a record number of previews, a string of actor injuries from elaborate aerial work and costs of $65 million by the time it opened. Most critics panned it. Taymor was still excited about her original ideas for the show. One of those ideas was the inclusion of the mythological Arachne character, which critics questioned but Taymor insists was central to the "Spider-Man" comic books. Another was the idea of using a nontraditional venue—like a circus tent on top of New York's Madison Square Garden. Regardless, Taymor was enthusiastic about the project from the beginning, and not just because of the collaborators involved. "Pieces that attract me have to do with outsiders," she said. Plus, "Peter Parker had everything to sing about—he had yearning, he had exuberance, he had unrequited love."